Received my new K2006 kit a couple days ago. Discovered my SWG pool has 25-30 CYA. It was recommended to me to raise that. So I bought some stabilizer in granular form. Instructions on the bottle: Broadcast into the pool, expect your filter to have high pressure for a few days, don't backwash it. Okay- I get it, it goes to the filter and dissolves over a few days from there. What I wasn't expecting: I spend 45 minutes brushing the granules around the bottom of the pool until they were pulled into the filter at the bottom of the deep end. The bottle made it sound as if most of them would dissolve, they didn't. Yes, it's normal. That's why we recommend tying the granules in an old sock and hanging it in front of a return. It dissolves faster, and won't clog the filter. And if you need to backwash, you won't lose any of the granules. 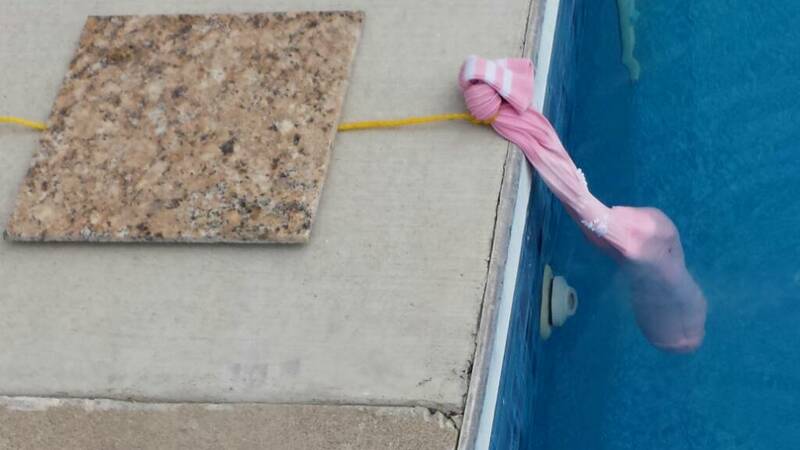 This is what I did today: I took a long piece of string and tied it around two old knee high socks and draped it across the diving board. Both socks are in the water dispersing the stabilizer. Hang it in front of a return? or just hang it in the pool? Also, my R0013 is one year old. Will it test accurately still? My CYA is hardly readable. Last year I was around 40 ( I think). Best to hang it in front of a return and let the flow help out. Hanging in the water will work, but it wont dissove as quickly. Squeeze the sock every now and then and it will go much quicker. Your R0013 should be fine. Its the colored regents for TA and CH tests and are most subject to going bad. You can hang the sock in front of a return, or set it in the skimmer as long as it doesn't block the flow and you leave the pump on the whole time. If you get flummoxed trying to figure out a way to suspend it, many people have tied it to a pool noodle or other floating toy and let that drift around. +1 on the sock method. I started out in the skimmer basket, then moved to the sock method infront of a return. Easier too to key an eye on. Sent from mobile device. Beware of brevity and spelling errors! mine too, scared to turn the water pink! LOL! Love my pink soccer socks for adding CYA! They're extra long, double layered. Bought them a few years back to wear in a 5K event or something and found a great use for them.